The aim of this dissertation is to assess the relationship between earnings management and internal and external audit practices in the UK. A sample of non-financial UK firms is investigated throughout the years 2010-2016. Abnormal accruals are used to represent earnings management. The results show no significant effect of audit committee characteristics such as size and meeting frequency on earnings management. At the same time, the findings from this dissertation suggest that companies audited by the Big Four are less likely to engage in earning management activities. The findings generally agree with the existing literature. Corporate governance has received great attention from practitioners and academics. An audit committee is regarded as one of the most important board committees as it reduces the information asymmetry between managers and shareholders. However, the findings of the present analysis do not support this view. Indeed, no significant relationship is observed between abnormal accruals and internal audit committee characteristics. Nevertheless, the quality of external audit is found to produce a significant effect on reduction of earnings management. This evidence proves that larger auditors are more effective in monitoring financial reporting. Corporate governance and audit quality have received great attention from scholars, managers, and shareholders. This area has become even more relevant in the context of the global financial crisis, as greater quality of accounting figures may reduce information asymmetry and strengthen financial stability. Existing theoretical frameworks provide no consensus regarding the expected effect of internal and external audit on earnings management. Likewise, empirical findings on this relationship are mixed, suggesting that additional research could be useful to understand how the effectiveness of corporate governance tools might be improved. The aim of the present paper is to investigate the relationship between earnings management and internal and external audit in the UK. To achieve this, several objectives are pursued. The first objective is to assess the impact of audit committee size of earnings management. The second objective is to explore the influence of the meeting frequency of the audit committee on earnings management. The third objective is to examine if the presence of a Big Four auditor affects the company’s earnings management. The present study contributes to the existing literature in several ways. The analysis covers a sample of large UK firms during the period 2010-2016. As few recent studies exist that focus on European companies after the financial crisis, this could be useful for assessing how UK companies might differ from other firms with regards to audit practices. Next, the sample includes smaller companies that are not audited by the Big Four. This becomes important as studies that investigate only larger firms may not capture the relationships between earnings management and external audit quality. Finally, the analysis explores both internal and external audit practices to examine the role of corporate governance in greater detail. The paper is structured as follows. Section 2 discusses earnings management from the perspective of several theories. Key audit committee characteristics and relevant empirical evidence are described. Section 3 covers the sample and the model used to estimate abnormal accruals and their relationship with earnings management. Main findings are presented in Section 4. The results are then discussed in the context of similar studies in Section 5. Section 6 concludes and offers recommendations on future research. The role of internal and external audit is linked to the understating of corporate governance in the context of several major frameworks, namely agency theory, stakeholder theory, and stewardship theory. The agency theory (Jensen and Meckling, 1976) provides a clear link between audit quality and earnings management. The framework proposes that managers act as agents for shareholders but ultimately seek to pursue their own interests. Shareholders pursue maximisation of the firm value, which might be hampered by managers engaging in opportunistic behaviour. Indeed, the theory suggests that agents would make decisions that benefit them the most regardless of the impact on the organisation. This naturally creates a need for supervising and monitoring mechanisms that would limit such behaviour while still allowing for enhancing shareholder wealth. Audit quality can thus be regarded as a controlling tool that may discourage managers from focusing on their own interests (Wiseman et al., 2012). More specifically, stronger auditing tools could make earnings management less feasible, limiting the harm that could be caused by managers acting out of self-interest (Jensen and Meckling, 1976). The agency framework predicts that improving internal and external audit would result in less or no earnings management. In particular, a larger audit committee with a greater number of independent directors may leave fewer opportunities for managers to use firm’s resources in an inappropriate way. This may be regarded as a controlling tool as opposed to a rewarding mechanism such as stock-based remuneration (Bonazzi and Islam, 2007). A larger external auditor may also be more effective at reducing agency costs as it would have more resources while being less inclined to cover earnings management due to potential reputation losses. Consequently, the interests of managers might become more aligned with shareholders’ interests as the former would have fewer opportunities for pursuing personal itnersts (Fama and Jensen, 1983). However, this influence might be offset by the increased costs associated with supervising (Jensen and Meckling, 1976). As such, the impact of specific characteristics including audit committee size and structure would depend on how potential benefits compare to the incurred costs. In contrast, stakeholder theory (Freeman, 1984) shifts the focus of the company from shareholders to all groups that may potentially be affected by the firms’ activity. In addition to shareholders this includes employees, suppliers, debtors, and socioeconomic groups that are influenced by the firm’s decisions. Social responsibility becomes an important concept within this framework, although financial stakeholders are likely to receive greater priority (Brown and Fraser, 2006). Based on the stakeholder perspective, improving audit quality can be regarded as a strategic tool for reducing the information asymmetry across various groups (Boyd et al., 2011). However, this also reflects a potential problem as the central role of an organisation may clash with the conflicts of interests between different stakeholders. While the agency theory assumes that managers act out of self-interest regardless of the impact on principal’s wealth, the stewardship theory proposes a different perspective. The framework regards managers as acting in accordance with shareholders’ interests and seeking to maximise firm value (Davis et al., 1997). The alignment of interests between the parties may allow for accomplishment of organisational objectives as managers could regard this as an intrinsic reward associated with their position. This contrasts the approach of the agency theory (Jensen and Meckling, 1976) and leads to different predictions regarding audit quality. More intensive auditing would result in higher costs while having little to no influence on managers’ behaviour. Furthermore, greater independence of the audit committee might reduce its effectiveness as executive directors would likely have more relevant knowledge regarding the firm (Al Mamun et al., 2013). Earnings management can be defined as “purposeful intervention in the external financial reporting process with the intent of obtaining private gain” (Schipper, 1989, p.97). In other words, the report is altered by the managers in order to mislead shareholders about the company’s performance (Healy and Wahlen, 1999). Earnings management has been measured by using abnormal accruals as well as estimating the propensity to meet earnings forecasts (Prawitt et al., 2009). Audit committee (AC) can be regarded to be one of the most crucial committees as it reduces information asymmetry between managers and shareholders (DeAngelo, 1981). The key functions of an AC include monitoring the company’s process of financial reporting and internal accounting as well as supervising risk management (Klein, 2002). The direct effect of the AC is reflected in the greater quality of financial reports and accounting figures (Contessotto and Moroney, 2014). At the same time, the effectiveness of an AC could be limited as it depends on several characteristics (Beasley, 1996). Several key factors were proposed by DeZoort et al. (2002), including composition, authority, resources, and diligence. Most notably, AC composition represents committee’s independence and expertise (Contessotto and Moroney, 2014), while meeting frequency can be regarded as a diligence measure (Vafeas, 2005). The AC size constitutes an important characteristic of the committee (Al-Matari et al., 2012). Greater number of members could allow for more effective use of resources and lead to lower agency costs (Jensen, 1993; Reddy et al., 2010). From this point of view, larger committees should be associated with lower likelihood of earnings management. However, communication problems arising from the increased number of directors might outweigh the benefits of improved monitoring (Sharma et al., 2009). Therefore, the exact impact of AC size might be challenging to predict even in the agency framework. Furthermore, the theory implies that AC members could also be associated with conflicts of interest, which would be exacerbated in a larger committee as agency costs would increase (Lipton and Lorsch, 1992). AC meeting frequency is another potential determinant of propensity of earnings management. It might be argued that greater activity represented by more frequent meetings would allow directors to carry out their monitoring function more effectively (Khanchel, 2007). Rare AC meetings could limit the members’ ability to investigate reporting practices. This is in line with the agency theory as stronger supervising mechanisms should discourage managers from misreporting accounting figures. Alternatively, frequent meetings could reflect directors’ inability to resolve issues more effectively (Bedard and Gendron, 2010). Meeting frequency is often represented by the number of official meetings, although it was noted that committees’ activity outside of scheduled meetings is equally important (Turley and Zaman, 2007). The independence of the AC may also be an important factor behind audit quality (Beasley, 1996). It can be regarded as the willingness to confront managers (Contessotto and Moroney, 2014), and it has been commonly measured as a ratio of the number of non-executive directors to the AC size (Carcello et al., 2011). Alternatively, a board could be considered to be independent if it includes a specific number of independent members. The positive role of independence is represented by the increased effectiveness of monitoring, as it separates the activity of executive managers from that of the committee (Krishnan and Visvanathan, 2008; Carcello et al., 2002). However, non-executive directors could have less relevant knowledge on the company and industry as a whole, leading to a negative relationship between independence and reporting quality (Sharma et al., 2009). This reflects the role of both education and experience of committee members (Giacomino et al., 2009; Hamid and Aziz, 2012). The presence of a Big Four auditor may increase the quality of financial reports (Piot and Janin, 2007). This can be attributed to two key factors. Firstly, larger firms have more resources and knowledge to provide effective monitoring of a company (McMullen, 1996; Francis et al., 1999). Secondly, the Big Four companies are less likely to cover opportunistic practices in financial reporting as they would seek to avoid reputation losses (DeFond and Jiambalvo, 1993; Krishnan, 2003). This would require maintaining an independent opinion which is more feasible for larger auditors (Piot and Janin, 2007). Auditor’s reputation can be used as a measure of the quality of external audit (DeAngelo, 1981). In general, the existing evidence regarding the role of audit is mixed. There is evidence that effective audit committees help reduce earnings management as shown by Klein (2002), Xie et al. (2003), and Bedard et al. (2004). Similar results were highlighted in the meta-analysis of Lin and Hwang (2010). The role of AC size is also related to the impact of general board characteristics which has been commonly examined by academics (Reddy et al., 2010; Bauer et al., 2010). Observation of negative relationship between firm value and number of board members suggests that a larger AC could also become less effective (Eisenberg et al., 1998). Similar findings were reported for audit committees by Bozec (2005), Al-Matari et al. (2012), and MoIlah and Talukdar (2007). In other words, a greater number of directors may not necessarily result in more efficient monitoring, as communication issues and agency costs within the committee would offset the benefits of a larger board. However, some evidence exists supporting the positive influence of firm size (Reddy et al., 2010; Al-Matari et al., 2012; Bauer et al., 2010). No effect on earnings management was found by Xie et al. (2003), Lin et al. (2006), and Abbott et al. (2004). Several empirical studies investigated the frequency of AC meetings with regards to firm value. Khanchel (2007) observed a positive impact of meeting frequency on performance. In contrast, Hsu and Petchsakulwong (2010) reported a negative relationship between the variables. However, both studies focused on emerging countries and might be less applicable to the case of the UK. More general studies of Xie et al. (2003) and Vafeas (2005) show that greater diligence reduces the likelihood of earnings management and fraud. No effect was reported by Bedard et al. (2004) and Yang and Krishnan (2005). The evidence regarding board independence is also mixed. Beasley (1996) reported a lower effectiveness of the committee that includes an executive. Similarly, Dey (2008) and Nuryanah and Islam (2011) observed a positive linkage between report quality and AC independence. Vafeas (2005) found that more independent committees are associated with reduced earnings management. In contrast, the findings of Dar et al. (2011) and Sharma et al. (2009) suggest that stronger independence leads to the AC members having less relevant experience, reducing the impact of monitoring (Rashidah and Fairuzana, 2006). The role of the largest auditors is similarly ambiguous. Piot and Janin (2007) found no relationship between the auditor choice and earnings management, with similar results obtained by Bedard et al. (2004) and Davidson et al. (2005). Kim et al. (2003) reported that larger auditors could be more cautious with respect to income-increasing earnings management. A reduction in earnings management due to larger auditors was observed by Becker et al. (1998) and Lin et al. (2006). H­1: There is a negative relationship between the number of members of the audit committee and earnings management. H2: There is a negative relationship between the number of meetings of the audit committee and earnings management. H3: Companies audited by the Big Four are less likely to engage in earnings management activities. This section presents the selection criteria for the sample, sources for the data, and estimated model. More specifically, the Jones (1991) approach to estimating abnormal accruals is presented. This is a two-step process that involves the calculation of abnormal accruals as residuals from a regression of total accruals on revenue change and plant, property and equipment (PPE) expenditure. The research aims to explore the role of audit quality in earnings management in the UK. This is done by considering a sample of UK firms listed on the London Stock Exchange during the period 2010-2016. The choice of the period allows for capturing the most recent trends while isolating the potential impact of the global financial crisis. The sample consists of 30 companies for which all necessary data on financial and AC variables is available. Only non-financial firms are included as estimating abnormal accruals for financial companies might be noticeably different from other industries. Only firms that have more than £1000 million in total assets are employed. This results in 25 large companies that are audited by one of the Big Four firms. In addition, 5 largest UK companies are included that are not audited by the Big Four. The list of the companies is presented in Appendix A. The data on financial variables for estimating total and abnormal accruals is retrieved from Thomson One Banker (2017). The data on AC characteristics, namely the number of committee members, the number of non-executive members, and number of meetings, is obtained from companies’ annual reports for the year 2016. The information on the external auditor is collected from the Independent Auditor Report section contained in firms’ annual reports. The present section contains key results on abnormal accruals and their relationship with the choice of external auditor as well as characteristics of the audit committee. Firstly, a descriptive analysis is performed to identify potential links between the variables. In particular, correlation between abnormal returns and AC characteristics is examined. Companies audited by non-Big Four firms are investigated in order to assess potential relationship between earnings management and smaller external auditors. Secondly, the linkage is analysed more thoroughly by estimating multiple linear regressions for signed and absolute abnormal accruals. Overall, no evidence in favour of the role of internal audit is found. Some support is obtained regarding larger independent auditors. 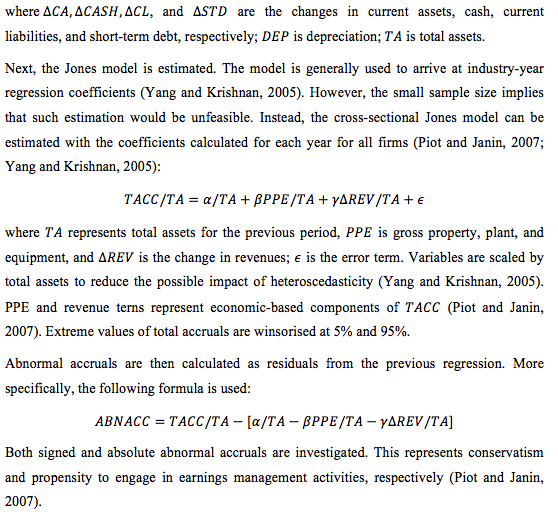 The abnormal accruals are estimated as residuals from the Jones (1991) model of total accruals. The latter are regressed on the firm’s change in revenue and PPE. In addition, firm size and sales growth are used as control variables in the main regression for abnormal accruals. The distribution of the relevant financial characteristics is described in Table 1. Scaled total accruals are negative on average, showing that firms’ growth in current assets tends to be lower than the change in short-term liabilities. However, the variability of total accruals suggests that a few extreme outliers are present in the sample. This can be mainly attributed to two companies, namely Shire and B&M European Value Retail. They exhibited significant changes in short term debt and cash holdings due to a large acquisition (Shire, 2012) and capital restructuring (B&M, 2016), respectively. Indeed, the companies greatly inflate the variability in total accruals while showing stable behaviour during other years. This justifies the use of winsorised accruals in the main model for minimising the impact of infrequent extreme values. The range of firm sizes reflects the use of largest FTSE100 companies alongside with largest firms that are not audited by the Big Four. Indeed, all five companies with the lowest total assets correspond to the latter group, with four firms audited by Grant Thornton and one firm audited by BDO International. The extreme values of the debt-to-equity ratio represent BT Group and B&M that held substantially more debt compared to other assets. Characteristics of average abnormal returns over the 2010-2016 period as well as internal and external audit in year 2016 are presented in Table 2. Most importantly, signed abnormal accruals are negative on average, suggesting that potential earnings management is associated with income-decreasing accruals. In other words, managers could be intentionally reducing profits. This is consistent with the use of income-decreasing earning management for mitigating political pressure and reducing stock value (Bedard et al., 2004). Average absolute abnormal accruals seem to be noticeable, indicating the general propensity of firms to earnings management (Piot and Janin, 2007). AC characteristics show a moderate degree of variability. The number of directors ranges from 3 to 9, although most of the companies appear to employ fewer members. Similar skew can be observed for meeting frequency, with the average value of 5.7 being close to the minimum of 4. At the same time, some companies, such as BHP Billiton and BP, show higher activity with 10 and 14 meetings, respectively. Only one firm, namely Eros International, has an executive director as a member of the audit committee. This justifies omitting the AC independence variable due to potential multicollinearity. 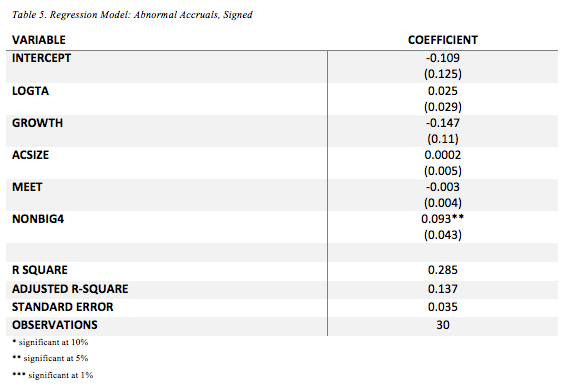 The relationships between AC characteristics and abnormal accruals are further explored by estimating linear correlation coefficients (Table 3). Signed show weak negative correlation with meeting frequency, indicating that higher activity might discourage income-increasing earnings management. This is further supported by the absolute accruals being similarly correlated with , although the value is relatively low. Even weaker correlation is estimated for abnormal accruals and AC size. Greater number of directors might have no observable influence of management practices. 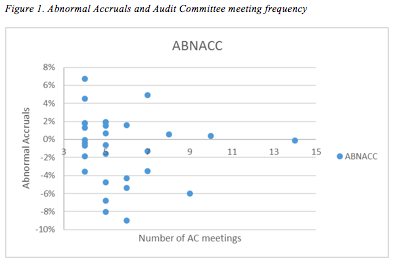 The potential link between accruals and number of AC meetings is illustrated in Figure 1. Larger absolute abnormal accruals are associated with fewer meetings. A more active and diligent AC could be more effective at controlling earning management. The discrepancy in accruals with regards to the independent auditor is shown in Figure 2. While firms audited by the Big Four tend to show negative abnormal accruals, the remaining companies tend to exhibit positive accruals. This may reflect larger auditors being more interested in controlling income-increasing earning management. Table 4 presents descriptive statistics illustrating this difference. Firms audited by the Big Four appear to have lower signed and absolute abnormal accruals. This supports the perspective on the large auditors being more effective at reducing earnings management. The estimated abnormal accruals are regressed on the key internal and external audit characteristics as well as control variables. Firstly, signed abnormal accruals are investigated (Table 5). The output shows moderate-to-low fit of the model. The adjusted R-square of 0.137 indicates that a noticeable amount of variability in sighed is explained by the included variables. Nevertheless, the value is relatively low, with only one regressor showing a statistically important effect. The dummy variable corresponding to the external auditor firm has a positive impact that is significant at the 0.05 level. As takes the value of 1 for the subsample of firms not audited by the Big Four, the result indicates that such companies are more likely to engage in income-increasing earnings management. This would be consistent with smaller auditors being less effective at discouraging such practices. 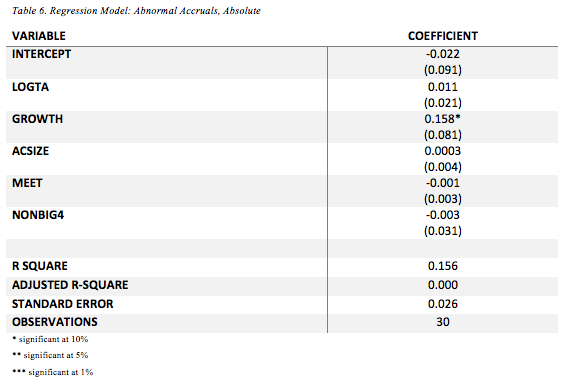 Secondly, absolute abnormal accruals are regressed on the same variables to investigate the general propensity of companies to earnings management (Table 6). The model does not appear to be suitable for explaining the variability of absolute abnormal accruals. Poor fit is reflected in the low R-squared value with no statistically significant effects of major variables. This may show that AC characteristics and the choice of the independent auditor have little influence on earnings management. The role of external auditor is further explored by investigating the difference in mean abnormal accruals for two subsamples defined by the variable (Table 7). The difference in signed abnormal accruals appears to be statistically significant at the 0.05 level. Put differently, companies that are audited by the Big Four are noticeably less likely to engage in income-increasing earning management. However, no similar result is obtained for absolute accruals, which could be attributed to the smaller firms showing little to no propensity to income-decreasing management. Overall, the findings show no evidence regarding the effect of AC characteristics on earnings management. This includes committee size and meeting frequency, suggesting that both hypotheses H10 and H20 should be rejected. However, some support is observed for larger external auditors being more effective at controlling earnings management. Signed abnormal accruals tend to be significantly higher for companies that are not audited by the Big Four. Therefore, the hypothesis H30 is not rejected. The results obtained in the analysis provide no strong support for the role of internal audit in the context of abnormal accruals. The AC size was found to have no influence on earnings management. This could be explained by the communication and agency costs within the committee offsetting the benefits from a larger monitoring body (Sharma et al., 2009; Lipton and Lorsch, 1992). The findings of the present analysis are consistent with similar studies that found no relationship between AC size and earnings management (Xie et al., 2003, Lin et al., 2006; Abbott et al., 2004). Similarly, no effect of the committee activity was observed. This is consistent with the perspective on more frequent meetings being associated with a less effective committee (Bedard and Gendron, 2010). Alternatively, meeting frequency might not capture the activity of the AC outside of scheduled meetings (Turley and Zaman, 2007). No impact of AC meetings on earnings management was also reported by Bedard et al. (2004) and Yang and Krishnan (2005). The negative influence of a Big Four auditor on abnormal accruals is consistent with the large body of literature suggesting that big auditors are more effective at controlling firms’ managers (Piot and Janin, 2007). This can be explained by larger firms having more resources and knowledge (Francis et al., 1999). In addition, the Big Four companies are less likely to cover opportunistic behaviour as they would need to defend their reputation (DeFond and Jiambalvo, 1993; Krishnan, 2003). The present study is consistent with the findings of Becker et al. (1998) and Lin et al. (2006). The present paper aimed to investigate the relationship between internal and external audit practices and earnings management. This was achieved by estimating total and abnormal accruals of large UK companies during the period 2010-2016. Two key characteristics of the audit committee, size and frequency of the meetings, were examined in the context of earnings management. It was found that internal audit had no particular effect on abnormal accruals, with hypotheses H1 and H2 being rejected. In contrast, external audit appeared to be a significant factor behind abnormal accruals. Specifically, firms audited by the Big Four engaged less in the income-increasing earnings management, providing support for the hypothesis H3. The findings were found to agree with the existing literature. In particular, the absence of effects of the audit committee characteristics has been reported (Xie et al., 2003, Lin et al., 2006; Abbott et al., 2004; Bedard et al., 2004; Yang and Krishnan, 2005). 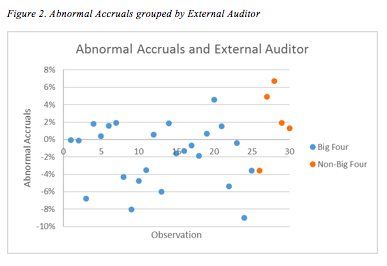 The negative impact of larger auditors on abnormal accruals is also consistent with the perspective on the Big Four having greater knowledge, resources, and reputational motivation (Lin et al., 2006; Piot and Janin, 2007). Overall, the results are in line with similar empirical research. The present study is subject to several limitations. The relatively sample size may limit the applicability of the findings to other UK firms. In particular, only five companies not audited by the Big Four were examined. The chosen period did not capture the effects of the global financial crisis. This could be important for exploring how the relationship between audit quality and earnings management changes in the environment of increased information asymmetry. The cross-sectional Jones model might also overestimate abnormal accruals for specific firms as they are not distinguished based on industry. Future research may expand on the employed model by considering modified Jones models for estimating abnormal accruals. The traditional Jones model could be less applicable to companies with extreme cash flows (Piot and Janin, 2007). The model can be adjusted to explicitly include cash flows when estimating the economic-based component of total accruals. This approach may be especially relevant for smaller companies that are not audited by the Big Four, as they could exhibit drastic changes in cash flows. The extension of the model may be applied to a larger sample covering non-UK firms to determine the role of country-specific factors. Abbott, L. J., Parker, S., and Peters, G. F. (2004). Audit committee characteristics and restatements. Auditing: A Journal of Practice and Theory, 23(1), pp.69-87. Al Mamun, A., Yasser, Q. R., and Rahman, M. A. (2013). A discussion of the suitability of only one vs. more than one theory for depicting corporate governance. Modern Economy, 4(1), pp.37-48. Al-Matari, Y. A., Al-Swidi, A. K., and Fadzil, F. B. (2012). Audit committee effectiveness and performance of Saudi Arabia listed companies. Wulfenia Journal, 19(8), pp.169-188. B&M. (2016). Annual Report 2015. [online] Available at: http://www.bandmretail.com/~/media/Files/B/BM-Stores/agm/ar-15.pdf [Accessed 25 Dec 2017]. Bauer, R., Eichholtz, P., and Kok, N. (2010). Corporate governance and performance: The REIT effect. Real Estate Economics, 38(1), pp.1-29. Beasley, M. S. (1996). An empirical analysis of the relation between the board of director composition and financial statement fraud. Accounting review, 71(4), pp.443-465. Becker, C. L., DeFond, M. L., Jiambalvo, J., and Subramanyam, K. R. (1998). The effect of audit quality on earnings management. Contemporary accounting research, 15(1), pp.1-24. Bedard, J., and Gendron, Y. (2010). Strengthening the financial reporting system: Can audit committees deliver? International journal of auditing, 14(2), pp.174-210. Bedard, J., Chtourou, S. M., and Courteau, L. (2004). The effect of audit committee expertise, independence, and activity on aggressive earnings management. Auditing: A Journal of Practice and Theory, 23(2), pp.13-35. Bonazzi, L., and Islam, S. M. (2007). Agency theory and corporate governance: A study of the effectiveness of board in their monitoring of the CEO. Journal of Modelling in Management, 2(1), pp.7-23. Boyd, B. K., Haynes, K. T., and Zona, F. (2011). Dimensions of CEO–board relations. Journal of Management Studies, 48(8), pp.1892-1923. Bozec, R. (2005). Boards of directors, market discipline and firm performance. Journal of Business Finance and Accounting, 32(9‐10), pp.1921-1960. Brown, J. and Fraser, M. (2006). Approaches and perspectives in social and environmental accounting: an overview of the conceptual landscape. Business Strategy and the Environment, 15(2), pp.103-117. Carcello, J. V., Hermanson, D. R., and Neal, T. L. (2002). Disclosures in audit committee charters and reports. Accounting Horizons, 16(4), pp.291-304. Carcello, J. V., Neal, T. L., Palmrose, Z. V., and Scholz, S. (2011). CEO involvement in selecting board members, audit committee effectiveness, and restatements. Contemporary Accounting Research, 28(2), pp.396-430. Chen, K. Y., Lin, K. L., and Zhou, J. (2005). Audit quality and earnings management for Taiwan IPO firms. Managerial Auditing Journal, 20(1), pp.86-104. Contessotto, C., and Moroney, R. (2014). The association between audit committee effectiveness and audit risk. Accounting and Finance, 54(2), pp.393-418. Dar, L. A., Naseem, M. A., Rehman, R. U., and Niazi, G. S. (2011). Corporate Governance and Firm Performance a Case Study of Pakistan Oil and Gas Companies Listed in Karachi Stock Exchange. Global Journal of Management and Business Research, 11(8), pp.1-10. Davidson, R., Goodwin‐Stewart, J., and Kent, P. (2005). Internal governance structures and earnings management. Accounting and Finance, 45(2), pp.241-267. Davis, J. H., Schoorman, F. D., and Donaldson, L. (1997). Toward a Stewardship Theory of Management. Academy of Management Review, 22 (1), pp.20-47. DeAngelo, L. E. (1981). Auditor size and audit quality. Journal of accounting and economics, 3(3), pp.183-199. DeFond, M., and Jiambalvo, J. (1993). Factors related to auditor‐client disagreements over income‐increasing accounting methods. Contemporary Accounting Research, 9(2), pp.415-431. Dey, A. (2008). Corporate governance and agency conflicts. Journal of Accounting Research, 46(5), pp.1143-1181. DeZoort, F. T., Hermanson, D. R., Archambeault, D. S., and Reed, S. A. (2002). Audit committee effectiveness: A synthesis of the empirical audit committee literature. Journal of accounting literature, 21, pp.38-75. Eisenberg, T., Sundgren, S., and Wells, M. T. (1998). Larger board size and decreasing firm value in small firms. Journal of financial economics, 48(1), pp.35-54. Fama, E., and Jensen, M. (1983). Separation of ownership and control. Journal of Law and Economics, 26(2), pp.301-325. Francis, J. R., Maydew, E. L., and Sparks, H. C. (1999). The role of Big 6 auditors in the credible reporting of accruals. Auditing: A Journal of Practice and theory, 18(2), pp.17-34. Giacomino, D. E., Akers, M. D., and Wall, J. (2009). Testing the financial literacy and expertise of audit committee members. The CPA Journal, 79(8), pp.66-71. Hamid, A., and Aziz, R. (2012). Impact of the amendments of Malaysian code of corporate governance (2007) on governance of GLCs and performance. International Journal of Social, Behavioral, Educational, Economic, Business and Industrial Engineering, 6(11), pp.3181-3186. Healy, P. M., and Wahlen, J. M. (1999). A review of the earnings management literature and its implications for standard setting. Accounting horizons, 13(4), pp.365-383. Hsu, W. Y., and Petchsakulwong, P. (2010). The impact of corporate governance on the efficiency performance of the Thai non-life insurance industry. The Geneva Papers on Risk and Insurance-Issues and Practice, 35(1), pp.S28-S49. Jensen, M. C. (1993). The modern industrial revolution, exit, and the failure of internal control systems. the Journal of Finance, 48(3), pp.831-880. Jensen, M. C., and Meckling, W. H. (1976). Theory of the firm: Managerial behavior, agency costs and ownership structure. Journal of financial economics, 3(4), pp.305-360. Jones, J. J. (1991). Earnings management during import relief investigations. Journal of accounting research, 29, pp.193-228. Khanchel, I. (2007). Corporate governance: measurement and determinant analysis. Managerial Auditing Journal, 22(8), pp.740-760. Kim, J. B., Chung, R., and Firth, M. (2003). Auditor conservatism, asymmetric monitoring, and earnings management. Contemporary Accounting Research, 20(2), pp.323-359. Klein, A. (2002). Audit committee, board of director characteristics, and earnings management. Journal of accounting and economics, 33(3), pp.375-400. Krishnan, G. V. (2003). Does Big 6 auditor industry expertise constrain earnings management? Accounting horizons, 17, pp.1-16. Krishnan, G. V., and Visvanathan, G. (2008). Does the SOX definition of an accounting expert matter? The association between audit committee directors' accounting expertise and accounting conservatism. Contemporary Accounting Research, 25(3), pp.827-858. Lin, J. W., and Hwang, M. I. (2010). Audit quality, corporate governance, and earnings management: A meta‐analysis. International Journal of Auditing, 14(1), pp.57-77. Lin, J. W., Li, J. F., and Yang, J. S. (2006). The effect of audit committee performance on earnings quality. Managerial Auditing Journal, 21(9), pp.921-933. Lipton, M., and Lorsch, J. W. (1992). A modest proposal for improved corporate governance. The business lawyer, pp.59-77. McMullen, D. A. (1996). Audit committee performance: An investigation of the consequences associated with audit committees. Auditing, 15(1), pp.87-103. MoIlah, A. S., and Talukdar, M. B. U. (2007). Ownership structure, corporate governance, and firm’s performance in emerging markets: Evidence from Bangladesh. The International Journal of Finance, 19(1), pp.4315-4333. Nuryanah, S., and Islam, S. (2011). Corporate Governance and Performance: Evidence from an Emerging Market. Malaysian Accounting Review, 10(1), pp.17-42. Piot, C., and Janin, R. (2007). External auditors, audit committees and earnings management in France. European accounting review, 16(2), pp.429-454. Prawitt, D. F., Smith, J. L., and Wood, D. A. (2009). Internal audit quality and earnings management. The Accounting Review, 84(4), pp.1255-1280. Rashidah, A. R., and Fairuzana, H. M. (2006). Board, audit committee, culture and earnings management: Malaysian evidence. Managerial Auditing Journal, 21(7), pp.783-804. Reddy, K., Locke, S., and Scrimgeour, F. (2010). The efficacy of principle-based corporate governance practices and firm financial performance: An empirical investigation. International Journal of Managerial Finance, 6(3), pp.190-219. Schipper, K. (1989). Commentary on earnings management. Accounting horizons, 3(4), pp.91-102. Sharma, V., Naiker, V., and Lee, B. (2009). Determinants of audit committee meeting frequency: Evidence from a voluntary governance system. Accounting Horizons, 23(3), pp.245-263. Shire. (2012). Annual Report 2011. [online] Available at: http://investors.shire.com/~/media/Files/S/Shire-IR/agm-documents/agm-2012/shire-annualreport2011.pdf [Accessed 25 Dec 2017]. Thomson One Banker. (2017). Thomson One Banker Database. [online] Available at: http://banker.thomsonib.com [Accessed 25 Dec 2017]. Turley, S., and Zaman, M. (2007). Audit committee effectiveness: informal processes and behavioural effects. Accounting, Auditing and Accountability Journal, 20(5), pp.765-788. Vafeas, N. (2005). Audit committees, boards, and the quality of reported earnings. Contemporary accounting research, 22(4), pp.1093-1122. Wiseman, R. M., Cuevas‐Rodríguez, G., and Gomez‐Mejia, L. R. (2012). Towards a social theory of agency. Journal of Management Studies, 49(1), pp.202-222. Xie, B., Davidson, W. N., and DaDalt, P. J. (2003). Earnings management and corporate governance: the role of the board and the audit committee. Journal of corporate finance, 9(3), pp.295-316. Yang, J. S., and Krishnan, J. (2005). Audit committees and quarterly earnings management. International Journal of Auditing, 9(3), pp.201-219. Size of the AC Number of non-executive directors AC Meetings SIC Audited by the Big Four?